I was working on an website development project today and I need to track down a font. I did a quick search and I found, as you might expect, many sites offering free fonts. And that's when I found Font Squirrel. ARE ALL THESE FONTS REALLY FREE FOR COMMERCIAL USE? As far as we know, yes. Please read the license on each font before you use them to be sure. And if you happen to find one that you think is not commercial, then please tell us. Also, some licenses may allow more uses than others. We have tried our best to mark fonts for different common uses. Read FAQ #8 below about embedding for more info. 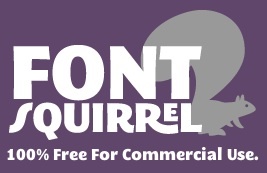 Check out Font Squirrel the next time you need a font for your project.